Asset Protection: Part 3 of 4, by Rocco Beatrice, Sr.
Our Ultra Trust® is an intellectual property right registered with the U. S. Patent Office, financially engineered to remove yourself from the probability of becoming the next creditor victim. This whole website www.ultratrust.com is devoted to the best methods and strategies of asset protection and our Ultra Trust®. A “TRUST” is nothing more than a “CONTRACT” between the person who wants asset protection (the Settlor), the person who will manage the assets (the Trustee), for the benefit of all Beneficiaries – whomever you choose. The Trust Agreement requires the transfer of assets to be protected from the original owner (Settlor) to a legal entity for the purpose for which the Trust Agreement was created. What type of trust, Grantor, or Non Grantor? What’s the distinction? A Grantor Trust take a special consequence within the tax code. Our Ultra Trust® is a “Grantor-Type Trust” for tax purposes is treated as a disregarded legal entity. The disregarded entity is “Income Tax Neutral” meaning that the original Grantor retained strings attached so that for purposes of the IRS income tax reporting, the original owner (grantor(s) retains the assets in his complete control, thus our Ultra Trust® is a “pass-through” to his form 1040 i.e. real estate tax deduction and mortgage interest deduction on his person income tax return, INCOME TAX NEUTRAL. Revocable, Irrevocable trust, what’s that mean? Revocable is when the original person with the assets transfers (repositions) the assets to a trust with strings attached. The Grantor, the Trustee, and the Beneficiary are the same person. Effectively you have done nothing, because it’s between you and you for the benefit of you. A revocable trust does absolutely nothing for asset protection because you can be forced to revoke it by a creditor or court. Many lawyers recommend revocable trusts for avoiding probate, recognizing that the trust is not worth the paper it’s written on for protecting assets against frivolous lawsuits and the avoidance of estate taxes or the 5 year Medicaid spend-down provisions. 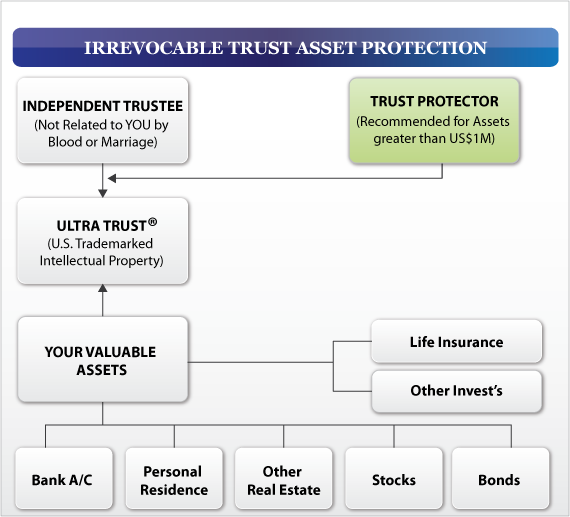 A properly written, executed, and funded irrevocable trust, such as the Ultra Trust®, is an extremely powerful asset protection device. The opposite of revocable is “irrevocable.” No strings are attached by the Grantor. “Irrevocable” means that nobody can force you to revoke it, and thus if executed correctly, gives phenomenal asset protection benefits. Once assets are transferred from the Grantor(s) to the Trust, the Grantor has no control, other than possibly some very limited powers. It’s this clear-cut lack of control and ownership that makes this trust very powerful asset protection device. You can’t be sued for assets you no longer own or control. The fiduciary duty of an independent trustee of an irrevocable trust is critical and viewed by the courts as golden. The Trustee must preserve the assets entrusted to him at any cost. Courts take a very unpleasant view on a Trustee who has abused his fiduciary duty. Breach of fiduciary duties by a Trustee could be considered and intentional tort subject to punitive damages. OUR irrevocable Ultra Trust® asset protection trust when combined with a Limited Liability Company (LLC) or Family Limited Partnership (FLP) is an asset protection fortress, short of a foreign asset protection trust. A foreign asset protection trust is the Rolls Royce of asset protection, the irrevocable trust with an LLC is the Cadillac / Mercedes / Lexis. The power of the Trust Protector is derived from the Trust Contract. The Agreement sets forth the dual function of the Trustee and the Trust Protector to give you a backup plan if the Trustee is not cooperative. While the Trustee can be a bank, CPA, trust company, or other financial institution, the Trust Protector is usually a person close to the family, a CPA, accountant, or lawyer who is already the family consiglieri. 1. Ability to remove or replace the Trustee without any explanation (Donald Trump style: “You’re Fired.” Often this is the only power granted to the Trust Protector. In cases where the Trustee is a corporate body (bank, trust company, insurance company, or professional trustee) if the Trustee is unresponsive or not performing to the Trust Agreement for the benefit of all Beneficiaries, or changes in management, or investment choices, the Trust Protector can fire and replace the Trustee, at will, without explanation to the current Trustee. 2. Ability to change the Trust’s situs to take advantage of law changes or necessary steps to act in the best interest of beneficiaries if they move from low tax states to high tax states, i.e. from CA or NY (high tax states) to NH, TX, or NV (low tax states) or changes in laws occurring long after the initial implementation of the Trust Agreement. 3. Ability to resolve deadlocks between co-trustees or in squabbling between the Trustee and/or Beneficiaries. 4. Ability to veto spending over a certain amount. This level of control is significant if disbursements of the Trust are in excess of pre-arranged amount requiring two signatures, the Trustee and the Trust Protector i.e. in excess of $20,000. 5. Ability to veto distributions to Beneficiaries. Before distributions are to occur the Trust Protector may want to investigate the financial stability of the Beneficiaries. For example, if the beneficiary is being sued, The Trust Protector may withhold distributions, or the Beneficiary is undergoing divorce proceedings, or the Beneficiary may be too young, is under duress, mentally incompetent, unable to manage, or otherwise unavailable. The Trust Protector can override/veto the Trustee and withhold distributions temporarily or permanently make other arrangements such as buy the assets necessary for the benefit of the beneficiary (buy a house, a car, sign a rental agreement, but have the Trust own the assets, make loans, or make other provisions. 6. Ability to veto investment decisions. This checking and balancing of investment decisions are based on the Trust Protector’s experience, prudence, and the Trust Agreement guidelines in protecting the assets for the Beneficiaries. 7. Ability to sue and defend lawsuits against the Trust assets. The fiduciary duty of the Trustee and The Trust Protector as to save the assets of the Trust, at any cost, for the benefit of all classes of Beneficiaries. 8. Ability to terminate the Trust. If in the opinion of the Trust Protector there are insufficient funds or the cost of administration is greater than available cost/benefit, the Trust Protector may terminate the Trust, as for example, if all beneficiaries have received their distributions based on age (over the age of 21) and there’s one minor beneficiary currently 10 years old, and there aren’t enough assets to administer the Trust for the next 11 years, the Trust Protector has the power to make the final distribution and terminate the Trust. The Trust Protector’s role is created by the Trust Agreement to add an additional layer of protection and is usually a person most familiar with the Grantor’s long term financial and personal goals. A Trust Protector usually is the balance of power between the Trust Agreement, the Trustee, The Grantor, and the Beneficiaries. Neither the Trustee or the Trust Protector should be anyone related to the family by blood or marriage. Both positions should be independent of each other acting in the long-term interest of the beneficiaries. We look forward to our visit with you and your professional representatives to assist you with the advancement of your estate planning. This statement is required by IRS regulations (31 CFR Part 10, 10.35): Circular 230 disclaimer: To ensure compliance with requirements imposed by the IRS, we inform you that any U.S. federal tax advice contained in this communication (including any attachments) is not intended or written to be used, and cannot be used, for the purpose of (i) avoiding penalties under the Internal Revenue Code or (ii) promoting, marketing or recommending to another party any transaction or matter addressed herein.